General Electric has agreed to merge its railroad business with Wabtec Corp. in a $11 billion deal. 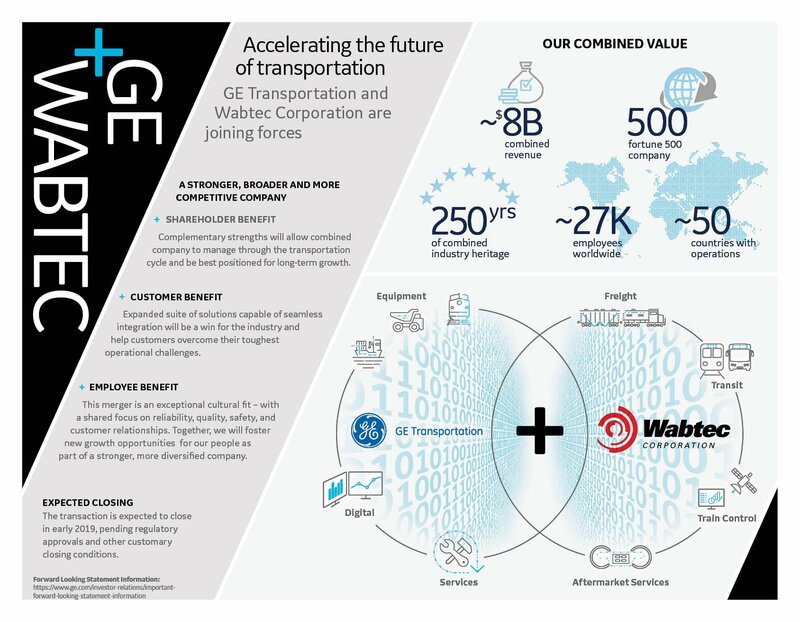 GE will receive $2.9 billion in cash at closing, according to the Board of Directors of Wabtec and GE. GE shareholders will also receive 50.1% ownership in the combined company. Wabtec, which is headquartered in the Pittsburgh suburb of Wilmerding, was formed in 1999 by the merger of Westinghouse Air Brake company and Motivepower Industries Corporation. It supplies tech-based products and services for freight and passenger rail. The combined company will provide more than 23,000 locomotives. It will operate in more than 50 countries. Once it is completed, Wabtec’s corporate headquarters will remain in Wilmerding, Pa. Wabtec’s Freight Segment will be headquartered in Chicago, and its Transit Segment headquarters will remain in Paris. Wabtec Chairman Albert J. Neupaver was reappointed as executive chairman of the merged company. Raymond T. Betler will serve as Wabatc&apos;s president and CEO. Stéphane Rambaud-Measson will become president and CEO of Wabtec’s Transit Segment. Rafael Santana, president and CEO of GE Transportation, will become president and CEO of Wabtec’s Freight Segment. GE Transportation is positioned for a rebound, according to a news release. Its backlog of approximately $18 billion includes about 1,800 new locomotives and approximately 1,000 to be modernized. The company has received $3.6 billion in orders in the last two quarters. Wabtec reported a strong first quarter and is forecasting growth for the year.